"Sampath Speaking" - the thoughts of an Insurer from Thiruvallikkeni: Super Blue Blood moon today ! ~ its significance !! Super Blue Blood moon today ! ~ its significance !! Today 31st Jan 2018 is a significant day ~ it is Thaipoosam – also Pournami .. .. religiously significant. On this day at Thiruvallikkeni divyadesam, there will be purappadu of Sri Parthasarathi Perumal to Big Street junction signifying harvesting. By no stretch of the definition is a full moon rare. It happens approximately once a month, or every 29.5 days. Occasionally, it happens twice in one month, approximately every three years or so. But .. .. there certainly is hype globally on a phenomenon known as ‘Super Blue Moon’ and there is to be lunar eclipse too .. .. !! 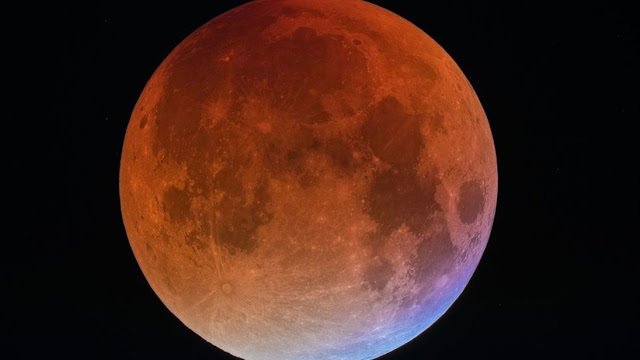 A lunar eclipse is a spectacular celestial show, during which the bright, pearly-white disc of the full Moon turns dark, and sometimes takes on the colour of dark copper, or even dried blood. A lunar eclipse occurs when the Sun, the Earth and the Moon are so aligned that for a period of time, the full Moon passes through the shadow of Earth in space (called Earth’s Umbra). A total lunar eclipse happens when the whole moon enters Earth's shadow. Some sunlight still reaches the moon, but first it goes through Earth's atmosphere. The atmosphere filters out most of the sun’s blue light, so the moon looks red. In US – the media is all gaga about the lunar phenomenon "super blue blood moon" taking place on Wednesday, January 31, 2018. Excitement is growing, even at NASA, where they plan to live stream the moon as it would dazzle skywatchers. The full eclipse will be visible on the U.S. West Coast, Hawaii, Alaska, Western Canada, Eastern Asia, Australia and New Zealand, and the event is slow and drawn out — the key is to get the timing of your viewing right. For instance, in the Pacific time zone the moon will be in totality — completely covered in Earth's dark shadow — between about 4:52 and 6:08 a.m., For locations farther east, the moon will set before totality is visible. A supermoon is named after a full moon when it is at the closest distance to the Earth in its orbit. When timing is just right, a full moon coincides with the moon's perigee (closest distance to Earth). This event usually occurs 3-4 times per year and most recently occurred on January 2nd 2018. The end result of the moon being closer to the Earth, it is 14 percent brighter than normal. You all would have heard the phrase : ‘Once in a blue moon’ ~ informally it would mean ‘very rarely’. Synonyms: hardly ever, almost never, scarcely ever, rarely, very seldom. Interestingly, the colour of moon is never blue. A blue moon is an additional full moon that appears in a subdivision of a year: either the third of fourth full moon in a season, or the second full moon in a calendar month. The phrase has nothing to do with the actual color of the moon, although a literal "blue moon" (the moon appearing with a tinge of blue) may occur in certain atmospheric conditions. The term has traditionally referred to an "extra" full moon, where a year which normally has 12 full moons has 13 instead. The "blue moon" reference is applied to the third full moon in a season with four full moons, thus correcting the timing of the last month of a season that would have otherwise been expected too early. The March 1946 issue of Sky & Telescope misinterpreted the traditional definition, which led to the modern colloquial misunderstanding that a blue moon is a second full moon in a single solar calendar month with no seasonal link. One lunation (an average lunar cycle) is 29.53 days. There are about 365.24 days in a tropical year. Therefore, about 12.37 lunations (365.24 days divided by 29.53 days) occur in a tropical year. Each calendar year contains roughly 11 days more than the number of days in 12 lunar cycles. The extra days accumulate, so every two or three years (seven times in the 19-year Metonic cycle), there is an extra full moon. The extra full moon necessarily falls in one of the four seasons, giving that season four full moons instead of the usual three, and, hence, a blue moon. Now getting back to “super blue blood moon” ~ it will be at its attractive best to those watching from the western part of North America, Alaska, and the Hawaiian islands. Beginning at 5:30 a.m. EST on Jan. 31, a live feed of the Moon is being offered on NASA TV and NASA.gov/live. You can also follow at @NASAMoon. Weather permitting, the NASA TV broadcast will feature views from the varying vantage points of telescopes at NASA’s Armstrong Flight Research Center in Edwards, California; Griffith Observatory in Los Angeles; and the University of Arizona’s Mt. Lemmon SkyCenter Observatory. 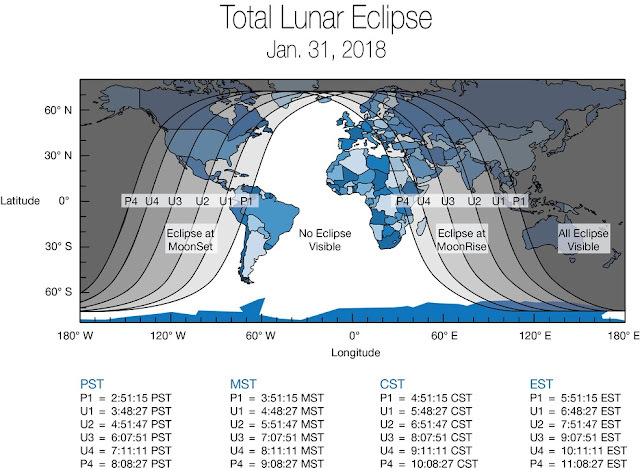 In India, the eclipse will start around 17:18 IST. It will be total at 18:21 hours and remain totally eclipsed till 19:37. Then after, the total eclipse will end and the Moon will slowly come out of the shadow of the Earth, the partial eclipse ending around 20:41 hrs. The totality of the eclipse will last for about 1 hour and 16 minutes. At Chennai at 16:21 the Penumbral eclipse would being though may not be directly visible. AT 18:21, total eclipse would begin and it could be a completely red moon. At 18.59, it would be max eclipse with moon closest to the centre of the shadow. At 20.41 hrs, the partial eclipse would end. At 21:38, the Penumbral eclipse too would end. Interesting it would be ! Collated from various sources in the web. India beats South Africa at Wanderers ! Welcoming New Year 2018 ~ in a saner way !! Did China supply Oil to North Korea illicitly ?? Winter fable : ant and grasshoppers ~ anew !! !